A creamy, dreamy dressing to add flavour and flair to seafood, potato and pasta dishes. Shake well before use and refrigerate after opening. It is normal for the coconut milk to solidify. 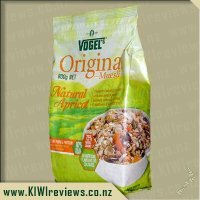 Contains New Zealand limes, coconut milk, soy and wheat. Nil gluten detected. Summer is a time for salads and BBQ&apos;s, but along with that comes the inevitable need for dressings to be made. If you&apos;re anything like me, I always forget to buy ingredients to make them, so I&apos;m stuck with a bog standard oil, mustard and vinegar. However, Barker&apos;s have brought out some products which may change this- dressings in some fantastic sounding combinations to get you out of the drudgery of boring Summer food. 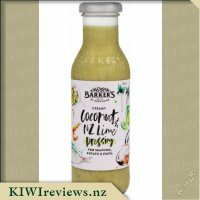 So, in the heart of Summer, what better time to review one of Barker&apos;s newest products, creamy coconut and NZ lime dressing. The first thing that is really nice about this dressing is that it comes in a glass bottle. 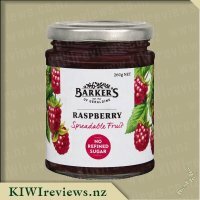 As usual, Barker&apos;s are showing some true class by using this more sustainable resource, making it feel like a truly premium product. Another benefit is that the bottle gets really cold in the fridge, meaning that the dressing comes out really nice and cold- really great for a nice crisp and refreshing salad. When you first open the cap, the zing of the lime combined with the creamyness of the coconut is truly delectable- my mouth was watering from that first sniff. I had to dip my finger in to have a sneaky try, and I was certainly not dissapointed by what I found. A totally balanced zingy yet creamy dressing, which hints of beach holidays. Nice and light so it isn&apos;t too thick on leaves, but holds its own to give you a taste of the tropical in every mouthful. Having tried it on our salads, which were definitely improved from my previous boring dressings, we then went on to test out its adaptability. We used it as a dressing over BBQ&apos;d prawns and grilled chicken, and also as an accompanyment to tinned tuna for both sandwiches and on baked potatoes. In all of these cases it hit the spot, and in each case, a new nuance of the sauce came through. Overall I have been very impressed with this product. It is totally delicious by itself, but when accompanying other ingredients adds a new dimension to any meal. 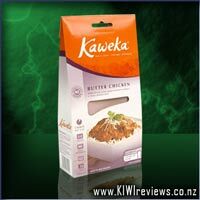 At $3.90 it is the perfect ingredient to keep in the fridge to add a little extra to any meal. 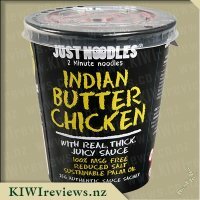 I cannot rate this product enough and will most definitely be keeping one in my fridge from now on. Thank you so much Barker&apos;s for livening up our families meal times- salads will never be boring again! 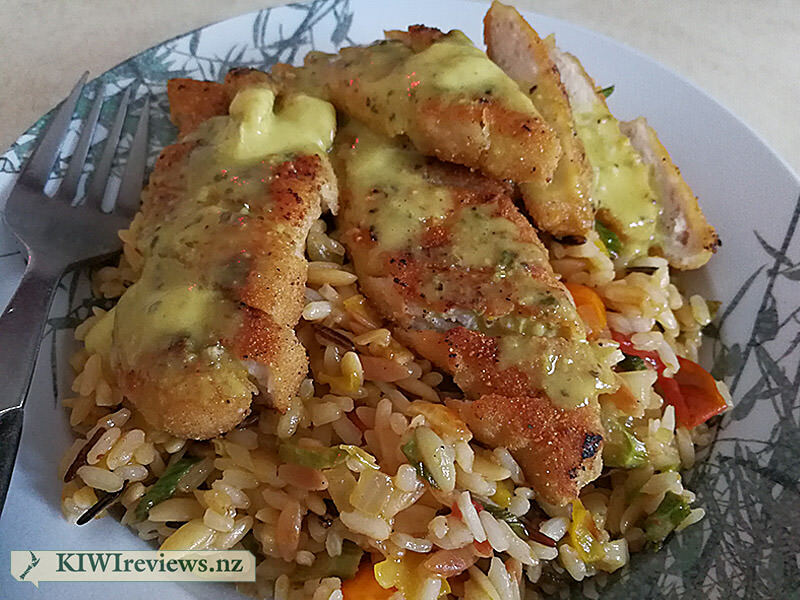 Wow this Barkers creamy coconut and New Zealand lime dressing is the tastiest sauce I have tried and I found it goes with most foods. I tried this with fish to start with and it was so good, it made it taste like a curry and the flavours from the sauce are just simply the best. I found it a perfect mix of coconut and lime and it reminded me of a Thai dish. My partner just loves this sauce and when he first tried it he could not stop raving about it saying we need to buy some of this. 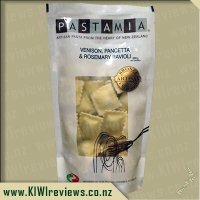 He also commented with how the bottle comments are good with seafood, potatoes and pasta, he reckons it should say is absolutely amazing with everything. He rates this dressing very high and I can guarantee that it will be being brought in our household. He said he really wants to try it with chicken and to marinate the chicken in the dressing overnight he said it would be amazing. So we gave it a go and it was so delicious. I feel this sauce is the prefect dressing to accompany any dish or meal or even as a marinade it is perfect. 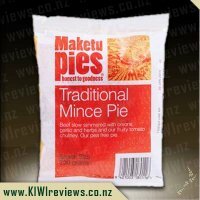 It turns something so simple in to e amazing flavoursome dish and it is so quick and easy to use. I love the bottle and the design on the label. Barker&apos;s products are always a treat and I find you are always guaranteed a great dressing when you buy barkers products. My fridge is full of all different sauce and dressing from barkers and this one will definitely be one my partner puts in the trolley all the time, I can see him raving about this dressing to his friends as well who have similar taste buds to him. My partner and his mates do a lot of fishing and diving and he commented how he is looking forward to trying this with crayfish once he gets in the water to get some. One thing about Barker&apos;s of Geraldine I can not fault them on presentation. I find the bottle with the etched logo on it, the label and the information top notch. I love how the bottle gives you suggestions on how to use the product with zany pictures and dobs of colour - I adore everything about this product. Then when you add the vibrant colour of the actual dressing to the mixture, it makes for one very good looking bottle that would stand out a mile away from the rest of the crowd. Dipping my finger in I was surprised to find it tasted like a Thai Curry minus the heat. It was so yummy that the four of us stood around licking our fingers. The only difference really between this and a sauce is this is very fine and is no where as thick as a sauce is. It also pours out very running and does not get stuck in the bottle like a thick sauce which is a great plus. The flavours mix in beautifully and nothing is over powering, I actually expected the Coconut to be the star of the show but it is so subtle and even the Lime doesn&apos;t stand out. The combination is fantastic. We have used this twice now, one on a quick Ham and Potato Salad and tonight&apos;s Fish Cakes. In saying that while eating tonight my husbands imagination took off and he is dying to try it with a Mango and Kumera Salad as well as a pasta salad or even a topping to a Vegetable dish. This dressing really could add value to anything you mix it with. With the fish cakes tonight, I felt like I was eating a Thai Cake instead of the Salmon and Potato mixed together. As with the Ham and Potato Salad it really gave a different element to the meal. I am excited at the possibilities that it could offer. 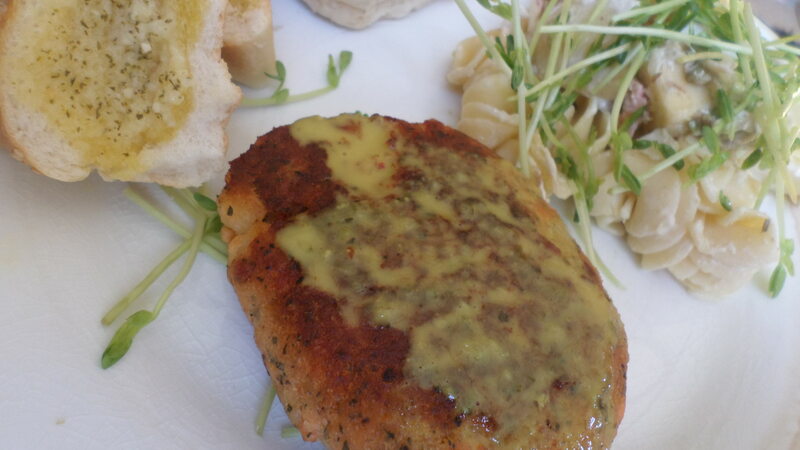 This is a dressing we will be having again, the uses it offers are very vast and I love that there is no heat to it. I can not wait to try on a Shrimp Cocktail or with a fried Fish. Even adding it to a rice meal is a possibility as the flavour would go with so many dishes. I am really impressed with this including the price. 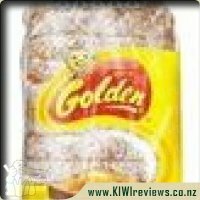 Another winner from Barker&apos;s which appeals to all age groups. When I read the description "creamy and dreamy" I had to laugh because this seemed a slightly unorthodox way to describe a dressing. However, I admit that it was definitely creamy - it has the texture of a pouring cream which means it coats food well without landing in blobs as some dressings to. As instructed, I shook the bottle before using: this had the effect of mixing the ingredients well and ensuring that any solidified coconut would be thoroughly blended in. The aroma when the bottle was first opened was quite tangy and the limes were the predominant scent. But when I tipped a drop on to my finger to taste, the coconut flavour came through to some extent. However, the dressing did not really taste of either lime or coconut. 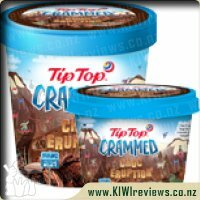 They had fused together to make a new flavour entirely which was unexpected but very pleasant. I was not sure whether or not I liked it, but a second taste assured me that it was very nice indeed. The bottle - which is up to Barker&apos;s usual standard in terms of label artwork - offered several suggestions for use. We were having a variety of vegetarian dishes for dinner so I thought I would try it on the avocado, cucumber and capsicum salad. The main dish was baked home grown broccoli and broccoflower with pine nuts and a mild cheese sauce, so I added some of the coconut and lime sauce to the cheese mixture. 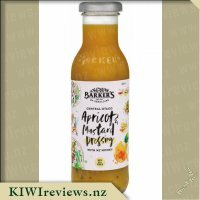 There were also two small shop-bought salads (potato and kumara) which were each treated to a few drops of Barker&apos;s sauce as well. Nothing like trying it in a variety of ways! The avocado, cucumber and capsicum salad tasted sensational - the sauce added flavour and brought the three vegetables together in a new and exciting way. I did notice that it was a bit runny, however, which I think was due to the cucumber. In future I will ensure the cucumber is drained and blotted dry before adding it. The biggest success was the avocado; it was an innovative and delicious alternative to my usual vinaigrette, and worth exploring further another time in combination with prawns. 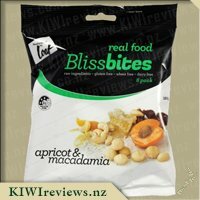 The shop bought potato and kumara salads did not really taste any different. Possibly I did not use enough sauce to add significant flavour, or maybe the dressing that was already on them was too strong to accommodate another addition. I don&apos;t usually buy prepared salads, so I will not be trying them again in this way; one of my friends had arrived with them as his contribution to the dinner, so in effect I added them simply because they were there! The broccoli and broccoflower bake was another story. The cheese sauce I had prepared was quite mild because I knew I was going to add the Barker&apos;s sauce as well. This combination was really nice. I did not tell my friends beforehand what I had added, so I was intrigued to find they were all way off the mark when asked to pinpoint the flavour. One thought I had used thousand island dressing although the dish was a mixture of creams and various shades of green with not a pink patch in sight. Another said it was tartare sauce! I told them in the end just to put them out of their misery. But this did show how well the various flavours had intermingled to create a new dish. The one thing we agreed on was that the meal was perfect. I am going to try out some of the other suggestions on the bottle, and also as the sauce in a prawn cocktail. In the meantime I have another avocado which is almost ripe, so I know what I am going to use with that. 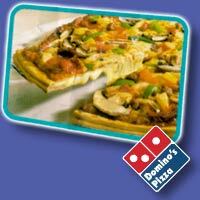 Lunch tomorrow is sorted! 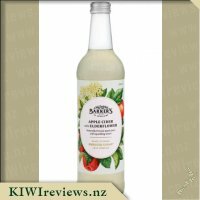 Barker&apos;s products are always on stock in my house, we generally always have at least 2 sauces on the go in our fridge, or some cordial made up, not only do the products taste great but through buying them you are supporting a NZ business. I was so excited to see that Barkers have done it again and released even more delicious items to their already amazing array of products, and seeing as these are dressings they couldn&apos;t have arrived at a better time, than just in time for Summer! Like all Barkers products the packaging is eye-catching and creative, with images which really reflect the use of the products and the ingredients within. 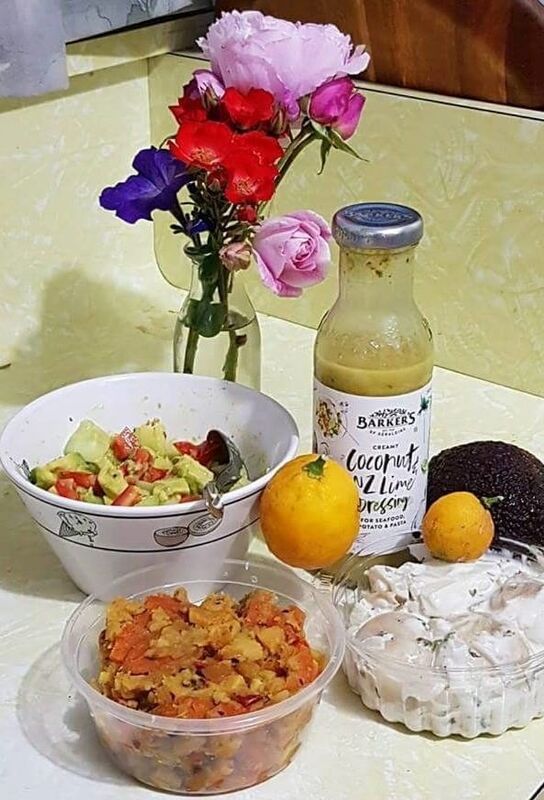 There are several suggestions listed on the label for which you could use the dressing for such as as a dressing for a kumara salad, or as a perfect partner on fish and other seafood dishes, though with a flavour such as creamy coconut and NZ lime the ideas really are endless! Another great thing about the bottle in which the dressing comes in (and like most other Barkers products) is that it is made from clear glass, not only does this mean it is recyclable but also that you can see how the product looks before buying and also you can tell when your supply is getting low! Over the past few weeks I have used this dressing in a number of ways both on my own meals and also on those which I have served up to family and friends. After opening the bottle after first receiving it and giving a wee taste test on the end of my finger I popped it into the fridge, and on next opening I found that it had solidified slightly, obviously as a result of it containing coconut milk, however this proved to be no problem I simply gave it a shake and left it out on the bench for several minutes to come to room temperature while I prepared the rest of my meal and then gave it another shake and it was perfect once again. The texture of the dressing is lovely and smooth and creamy, the first thing I tasted is the zing and tanginess of the lime, which is surprising as the coconut milk is 62% of the ingredients! It&apos;s not long before you do start to taste the creamy coconut flavours coming through however! 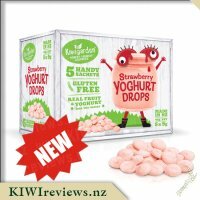 I have friends who are real fans of coconut and they loved this I had it out with a variety of other dressings during our monthly dinner catch up and everybody raved about this on their salad and said it&apos;s on their to buy lists for the Summer months. 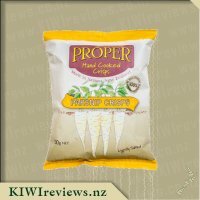 Although this is great on salads, I have tried on both a green salad and also on a potato salad with great successful it is also a great addition and adds a whole new dimension of flavour to fish that has been dusted in flour and cooked in butter and it also makes a great dip to have with kumara chips when mixed with a little bit of greek yoghurt to thicken it up. 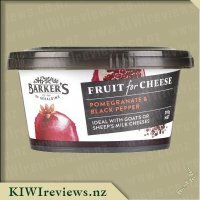 Barkers have done it again with another great tasting product, I have seen some other great sounding dressing flavours of there&apos;s at Countdown which I can&apos;t wait to try out next! Well, I have to say this was one of the more versatile dressings I have come across in a while, and I loved it. With a hint of tropical and a dash of Asian in the flavour profile, it lends itself to a number of possibilities... and if I have one complaint it is that I can&apos;t find it in 5L bottles! Wanting to really see how widely it could be used, I set up a menu that would stretch the boundaries of what I thought this may work with, and then threw in a dish I was totally unsure of, just as a final test. The first course was salad - a green salad with lettuce, spring onions, grated carrot, some baby perpetual spinach and some rocket, plus a bit of grated cheese and sliced avocado... topped with a swirl of this dressing. All I can say is, I found it to be a delight to eat! The smoothness of the dressing nicely offset the sharpness of the rocket and brought the rest of the flavours together in my mouth in a most pleasing combination. The second course was some crumbed chicken cutlets served atop a light vegetable risotto made with onion, capsicum, tomato and asparagus with some fresh basil tossed through it just before serving. As you can see from the linked photo, it was visually appealing and I can assure you it tasted great. The Asian aspect of the flavour profile really stood out in this dish and it is one I fully plan to repeated, semi-regularly! The final dish was a dessert idea... and I admit I was very hesitant to go ahead with it. Mainly because by this stage I was in love with this dressing and I didn&apos;t want to waste any. Still... a slight readjustment of the recipe meant I could get away with using a very small amount of the dressing and still have a chance at tasting whether the dressing would work. So... I made savoury waffles! Adding some of the dressing into the waffle batter, I cooked up two full-sized waffles but I left them to cook until just steamed through rather than leave them to go golden. I find waffles less appealing if they are cooked to traditional standards - too dry and crisp for my tastes. Two waffles, with some bacon and grated cheese sandwiched between them, and a VERY light drizzle of the dressing on top, then eaten with a knife and fork. Odd? perhaps. Tasty? surprisingly, very! 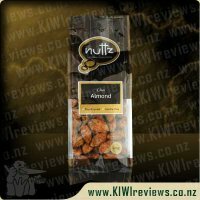 I found them to be a true delight and a very unusual taste sensation. Not unpleasant, but I would say that some people wouldn&apos;t be brave enough to try them, and of those who did, many would not enjoy them... but I travelled a lot as a child, so got used to some very &apos;odd&apos; dishes according to Western tastes. Overall, would I buy this again? Yup! Already have it on the shopping list for tomorrow! I would also very happily endorse and recommend this to anyone who wants to try something different but not too wildly outside the norms.